Effective book publicity is vital to a robust book launch. One of the advantages of being published by a major, traditional publisher is that you'll have the support of the publisher's in-house publicity department. 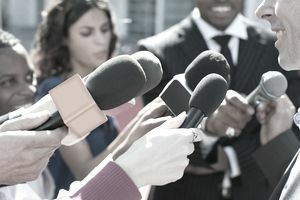 How large the publicity campaign depends on many factors, but here are the basic elements that an in-house publicity department will likely provide. Your publicist (or another member of the department) will develop and write a press kit, which generally consists of a press release and (with input likely drawn from your author questionnaire) a bio page, and perhaps some supporting materials such as an "Author Q&A" or sample questions for the press. You will likely be asked to provide the author photo. Where long-lead magazines are important to publicity, your publisher may print galleys (or their fancier, more expensive cousins, ARCs) and your publicist will mail them out "free and review" to the media, along with printed copies of your press material. This is so the magazine can review the book in time for publication. Note that galleys are expensive to produce and publishers sometimes forego printing them; most galleys are available electronically through services like Edelweiss. Your publicist may mail your finished books, accompanied by press materials. Generally, in order to save money, these only go to high-publicity potential periodical editors or media producers or those who have requested them. The book publicist will follow up with any media outlet that responds to the mailings or emails, will mail additional copies of the finished book, and will make additional calls or emails to other outlets to remind them the book is in their inbox. Your publisher should provide transportation to support for any outlets or events where they have booked you, whether an airplane ticket (coach!) and town car to get you to "The Today Show," or reimbursed car mileage or cab fare for an appearance at a trade show. If a public appearance that your publicity department has arranged includes a book signing, the publicity department generally coordinates with the other publisher departments to ensure the presence of your books to be sold and signed. Your publicity department should respond to your occasional requests to send your book to specific reporters or media outlets where you have a good contact or an "in." Even the publicity campaigns for the most prominent authors and books contain these basic publicity elements—they generally vary in breadth and scope and degree of follow-up.